Buying a new range for your kitchen isn't the same as replacing a few pots and pans or investing in cutlery. 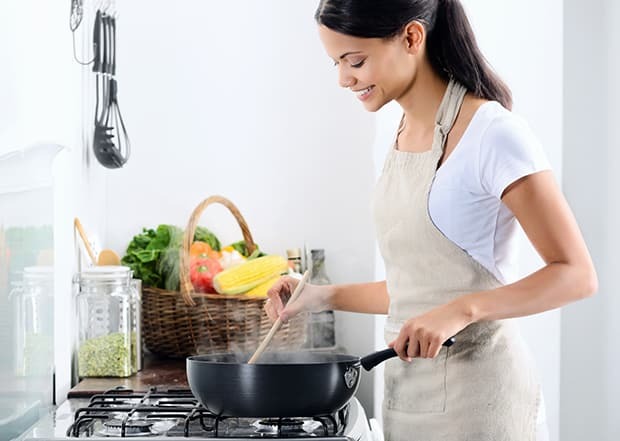 The range is where most of your cooking gets done, and every home chef – amateur or expert – needs reliable appliances. Homeowners about to invest in new high-end ranges shouldn't shop blind. Arm yourself with information and you'll be ready to make the right choice for you and your kitchen. Ranges come in three basic varieties – induction, gas and electric – and most folks have pretty strongly held opinions about which they prefer. While there's no right or wrong, knowing which type of range fits your cooking style best is important. Gas ranges have been around for a long time, and even today many cooks prefer cooking with gas because of how immediate the heat builds up and how they can control the flame. Gas ranges require a gas line to operate. Electric ranges can be extremely convenient, especially if you're looking for an easy-to-clean option. Many modern electric ranges radiate heat through a ceramic or glass range top, which can be easily wiped clean once cool. They require an electrical outlet instead of a gas line and are popular with homeowners who do not have a gas line. Induction ranges are a fascinating alternative with a devoted following. While electric and gas stoves cook food by warming the pot or pan itself – either with an open flame or a heating element – induction ranges use electromagnetism to heat the cookware directly. This means that the range top stays cool the entire time you're preparing a meal. And proponents of induction ranges say it produces a more evenly heated cooking surface and allows for precise temperature control, as well. Depending on what kind of range top you get, there are going to be some features you definitely want to consider. For instance, does your gas stove come with sealed or non-sealed burners? Sealed tend to be easier to clean, but if you're looking for a more commercial kitchen vibe in your home open burners might be preferable, since they provide a more open flame. You can even invest in a dual fuel range, which comes with both gas and electric burners, so you've got the best of both worlds. Of course, one of the most important questions to ask yourself while you're shopping is how large a range you need. Depending on how much cooking you do, choose between 24-, 30-, 36- or 48-inch units, each equipped with a ranging number of burners in various sizes. If you're investing in a range equipped with an oven, there's a whole lot more to consider than just the range top. For example, does your model include a drawer for storage underneath? Are shelves adjustable? Is the oven self-cleaning? Figure out what your primary needs are to ensure that the oven is up to par. For instance, if you entertain often you may want to invest in a range/oven combo that comes with a warming drawer. This will allow you to keep parts of the meal warm while you finish cooking. There are other features some folks won't want to go without on a range. For instance, you may want to consider a model that has an LP conversion kit if the house has a propane tank. You might also want a battery operated pilot ignition, to make using your gas stove even safer. Before buying a new range, don't just decide on gas, electric or induction – make sure you get all the information on the special features you want and need.